The Tennessee tea party Republican who recorded himself pressuring his mistress into getting an abortion is happy to say the whole thing was a false alarm. 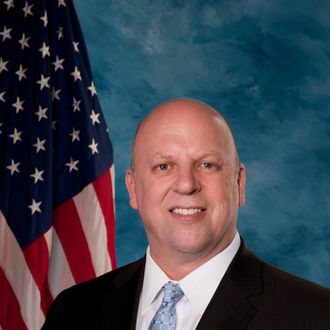 “I don’t mind telling people that there was no pregnancy, and no abortion,” said Representative Scott DesJarlais, who is running for reelection, in his first comments on the scandal. “But I also don’t mind telling people that this was a protracted two-year divorce back in 1999 and 2000. There was some difficult times, for sure.” DesJarlais, as reported by the Huffington Post this week, taped himself pushing a woman — a patient he’d been sleeping with while working as a physician — to have an abortion, in hopes of showing the recording to his wife and saving his marriage. Needless to say, it did not work out, although apparently he got all worked up and outed himself as a huge hypocritical sleaze for nothing. Never mind that insisting with such fervor and recording the call seem like desperate measures when you’re not even sure she’s pregnant, but the release of the conversation is “old news” anyway, according to his campaign. During DesJarlais’s ugly House race in 2010, allegations surfaced that he threatened his ex-wife with a gun and once held a firearm in his mouth for hours, but the almost-abortion stuff actually happens to be new. The Memphis Commercial Appeal reports that DesJarlais blames the leak of the transcript on “a disgruntled, defeated ex-congressman, a vindictive ex-wife, and a desperate Democratic candidate.” But for screwing around with a patient and taping himself bullying her into an abortion she didn’t even need, we’ll give DesJarlais some credit here too.